An easy way to boost your protein intake. Protein is essential component of every cell in the body. It’s a macronutrient made of 22 ‘building blocks’ called amino acids bonded together to form protein’s structure. Proteins have different functions in the body, including contributing to a growth in muscle mass and contributing to the maintenance of muscle and normal bones. Proteins from foods like soy and dairy are termed ‘complete’ proteins because they contain a balance of all the essential amino acids (or building blocks) for the growth and maintenance of muscle. One level tablespoon of powder (6 g) supplies 5 g of protein. Take one to four servings daily. 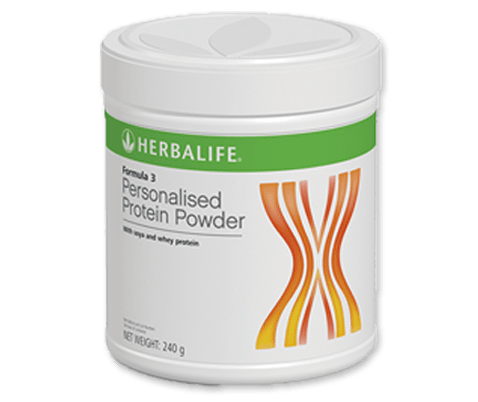 Formula 3 can be added to your Herbalife Formula 1 shake or stirred into other foods such as sauces, soups and gravies.